Can “2nd Worst” Place for Blacks Improve? How local leaders should respond to metro Milwaukee’s low ranking in recent study. 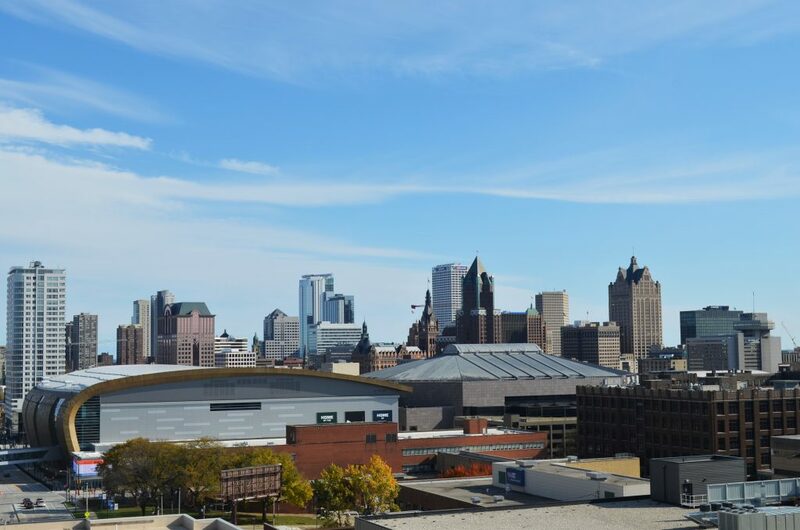 View of Downtown Milwaukee from parking structure near Pabst Milwaukee Brewery & Taproom. Photo by Jack Fennimore. It is always a bad thing to be the worst or even second worst at something. But being the second worst city for black people isn’t the same as having a lousy sports team. It is a measure of human suffering, loss and unfulfilled promise. The findings in the recent 24/7 Wall St. report are stunning but not surprising. Some will (correctly) see them as a source of shame and a stain on the city’s reputation. Others will point to signs of progress. And, of course, there will be the comments from some JS Online readers who will see it as proof that it’s all black people’s own fault. In the end, the report might pass as a one-day story. Except…. Talented black people, especially young ones, who might have thought about moving to Milwaukee, may give it a second thought if they do some minimal research. And young black Milwaukeeans, as well as non-black people with a sense of social justice, may ask themselves: what am I doing here? So, rather than reinforcing a fairly widespread sense of hopelessness and defeat, why not pose the most basic of question: what can be done to make a measurable improvement in the lives of struggling black Milwaukeeans? Let’s start with a set of assumptions that should be tested by two groups of people who can make a difference: those who live in black neighborhoods, and those who have the power, authority and resources to produce real change. Assumption Number One: There is the need for a concrete vision of a better future. The 24/7 Wall St. report provides a baseline, a starting point. Here is a vision to change that: By 2030, Milwaukee will not only not be the 2nd worst city for black people, it will no longer be on the list of the top (worst) 20. (Note: based on experience, if you don’t start with a vision for a better future, pessimism will be in the driver’s seat within minutes.) What do we want these communities to look like in 10 years? What are the challenges that we need to overcome to get there, our action agenda? How do we execute? Assumption Number Two: While the people living in these communities have multiple concerns, they have one fundamental need: money. It does not take a genius to figure out that the reason that there are no local businesses on north side commercial streets is that there isn’t enough money in these communities to support those businesses. In this context, there must be a commitment to two separate goals: jobs and living wages. Assumption Number Three: These communities are likely to remain segregated during this period. The integration that takes place is probably going to take the form of gentrification, which can price people out of already stressed neighborhoods and into even more fragile ones. How do you prevent this outcome? Assumption Number Four: Beyond money, there is going to be a need for a deeper and broader range of high quality services than exists today. Anyone who believes that significant positive change can happen with, as they say, “existing resources” is deluding themselves and misleading communities in ways that will only result in deeper pessimism and mistrust. Assumption Number Five: Tinkering around the edges won’t work. Even successful and admirable undertakings, like the Zilber Neighborhood Initiative and others, have been too limited. If they hadn’t been, Milwaukee would not be in second-last place. It is that simple. What is needed is an all-in approach on the parts of government, the corporate sector and philanthropy. And, it is government, which ostensibly represents the broad public interest, that should lead the way with money and planning. It has the greatest interest in these communities. And corporate “win-win” strategies, “impact investing,” “green bonds” and “business knows best” mantras are likely, at best, to amount to tinkering around the edges. There is a back-to-the-future need here for a local initiative on the level of the Great Depression era WPA. That approach correctly places a big burden on government, one for which the now standard shrinking violet, “we’re doing our best,” worldview won’t work. Nor should we accept the rationale that big investments in upscale, gentrified communities throw off tax dollars that provide the needed support for distressed neighborhoods. Again, if that were true, we wouldn’t be looking at these numbers. And, as a mandate to those facing the current reality, it is worth ending with a quote from the historian T.W. Maitland: “We should always remember that what now lies in the future once lay in the past.” Wouldn’t it be a beautiful thing to picture a big ceremony in 2030 in which a group of Milwaukeeans, black, white and everyone else, burns the 2018 24/7 report and celebrates the city becoming a national model for racial progress. Frank Schneiger is founder and president of Frank Schneiger and Associates, a management planning and consulting firm, and has held top government positions for both the city of New York and the Commonwealth of Massachusetts. Climate Crisis: Climate is an urgent, life-and-death matter that we must address boldly and immediately. The U.S. government will not act. It’s up to us to act right here in our own community. Economic Crisis: People of color in Milwaukee are living through a permanent economic depression that would never be tolerated for white people. We cannot in good conscience allow these conditions to persist. The necessity of acting on climate is an opportunity to take on the long overdue moral imperative of creating a racially equitable Milwaukee. We Can Do It: We have the know-how to overcome the climate crisis and the equity crisis. We can move to 100% clean renewable energy with 100% good jobs, especially for those who suffer discrimination and segregation. Growing Movement: Dozens of cities are committing to 100% clean, renewable energy to avoid a climate catastrophe and take advantage of the economic opportunities in efficiency and clean renewable energy. The City of Milwaukee has agreed in principle. Now it’s time for a real action plan. We Can Lead: Milwaukee has the power to lead the state and nation in the clean energy revolution. Our city can be cleaner, healthier, more equal and more economically secure than ever before. Jobs, job, jobs is the mantra, but without a new housing policy where people can find and live in affordable, safe , clean housing — they can’t get jobs (no address), keep a job (evicted) or raise a family and send their children to the same school for more than 4 months at a time. Housing is a critical first step — and it can NOT be subsidized market housing — that just will never work if it’s in the hands of people whose basic motivation is to make money.